As well as making pieces of art, I also make an eclectic assortment of accessories: miscellaneous things that I create on a whim, as and when they please me. My inspiration comes from a variety of sources: the things I see people wearing, the pictures I come across on the internet and in magazines, the treasures I find in local and far-away shops, and the thoughts and themes that enter my own head, usually at random. I make them because I want to, because I enjoy making them, because making them affords me a well-earned break from my other more cognitive pursuits – like writing, researching, teaching, healing, stitching and studying. And I like that these items might in turn be useful and that other people might also admire and desire them; after all: there are far too many for me to keep. These cases form my Apple Collection. 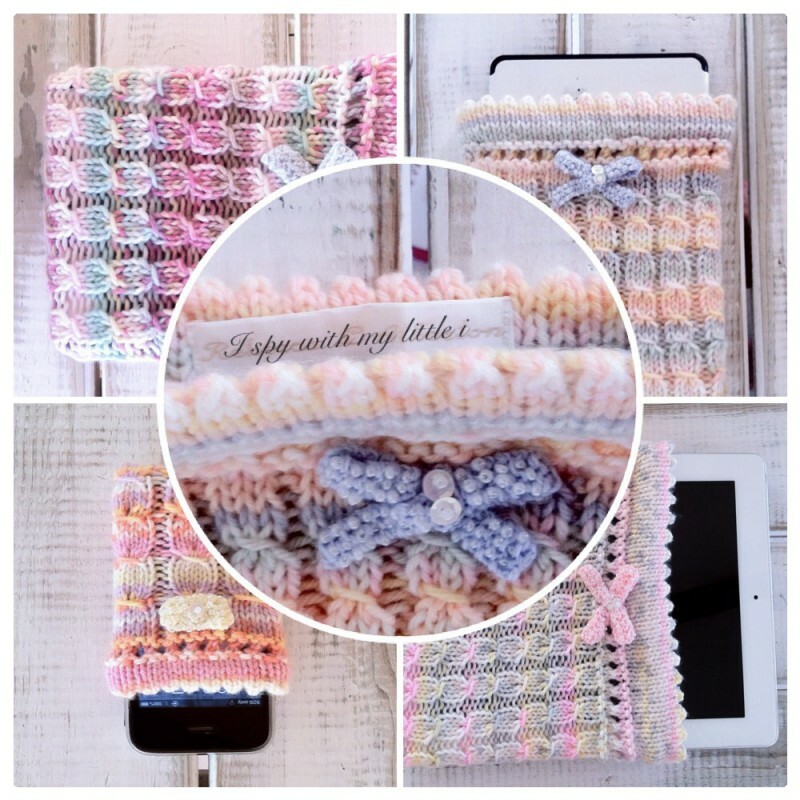 As the title suggests, they were made especially for your gadgets. They were created whilst travelling – in the car or on a train, bus or plane – journeying at speeds of up to 120 km/hr (unless we’re talking the plane, of course, which went a lot faster), often with a chihuahua sitting in my lap. Their purpose, twofold: a) to alleviate my passenger anxiety (a state similar to travel sickness, defined by an irrational fear of the road, accidents and other cars) and b) to provide employment for my hands, which dislike to remain idle as they’re not very good at it. If you would like to buy one of my pieces, click on the image of the piece would like, then follow the instructions on the corresponding page. If you would like me to make you one in a different pattern, colour or yarn, or for a different device: send me an email with your request and details and I will see what I can do. If you are in any way confused (don’t worry it happens to the best of us), please don’t hesitate to contact me. I will be glad to clarify and help in any way that I can.